Hi all! How is 2016 going for everybody? Mine has been busy and filled with lots of snow! Today is the release of the Dark Protector novella bundle, and I thought we should celebrate here with a couple of giveaways. 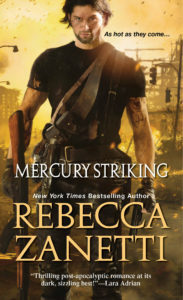 I will draw names a week from today, during the celebration for the Mercury Striking Release. Not even when she learns she once agreed to mate him. Yeah, that was years ago, before she was kidnapped and tortured, before she lost her memory. Now she knows just one thing about herself–she’ll do whatever it takes to bring down the monsters who took her, even trust her ex. I will draw five names, and the winners can choose if they’d like a print copy of Consumed, Provoked, Shadowed, or Marked…or ebook copies of Wicked Ride or Wicked Edge. To enter, you must answer ONE of the questions below. (You can answer all of them if you want.) Good luck! If you’ve read the novellas before, which was your favorite and why? If you haven’t read the novellas, which television show are you addicted to right now? If you’re not addicted to a television show, what’s your favorite food? I am addicted to VIKINGS right now. It is truly amazing. My favorite food is home made Country Fried Steak with a baked potato. I can’t get enough of it. Love your books. I’ve read your novelas …every book in the Fated series. Truly one of my favorite series out there ! Just a few of my favorite shows….Scandal, The Good Wife, Suits, Game of Thrones, Limitless, Girls, I Zombie, Jessica Jones, House of Cards, Orange is the New Black, Banshee, Outlander. Since I have not read the novellas, my favorite TV she is ‘Heroes Reborn’. My favorite food is spaghetti, followed by pizza. Haven’t read many novellas. Pizza is my favorite food. Since I’ve only had the opportunity to read the first novella I’ll tell you that I have two relatively new TV addictions. Outlander, based on the book series which I’ve also not yet had the chance to read, leaves me gritting my teeth in impatience when I have to wait for the next disc to arrive from Netflix. Fortunately I was able to binge watch Jessica Jones, based on a Marvel comic character, on Netflix within a few days. The first is a Scottish time traveling romance, emphasis on the hot Scot lead, and the second is a strong female lead struggling with her own personal demons trying to fight evil. Love them both! I also LOVE The Walking Dead and American Horror Story. I am addicted to Castle. I am currently addicted to Shark tank. Already read them all and loved Twisted the best, because I feel there was the most build up leading to it: Maggie’s memory loss, Terrent’s mysterious interest in her, the vaccine tampering. I also love watching Game of Thrones, House of Cards, Hawaii Five-O, and Amazing Race! 2) TV Show – I find Blindspot very interesting and am eagerly awaiting the next season to start so that I can see what happens after the cliffhanger. Haven’t read many novellas lately and I’m not really into any television shows at the moment BUT I’m looking VERY forward to “Lucifer”. I haven’t read them but I am addicted to NCIS! I am addicted to Quantico right now. It’s an amazing new series and full of action and deception with a little hotness on the side! 2.I’m into this new Amazon original series called Man in the High Castle. It’s pretty good. My favorite food is shrimp anything shrimp except shrimp cocktail. Don’t like it cold. Thanks, would love to win a copy of one of your books to read. I am completely and utterly addicted to Downton Abbey! Congrats on releasing them all together! It’s hard to pick a favorite from these guys. I really enjoyed all of them and wish they had been full length novels. I guess I’d pick Max and Sarah as my favorite. Max is such a stoic and strong protector over Janie when he’s first introduced in the series and you know the big guy has to have a soft side. This really showcases that, his love for Sarah and the Kayrs family, even though he’s got a dark past (we need more of that!). I loved Sarah’s gift too, very different than the psychics and empaths. I have read all the novels and these 3 novellas. At first Terre was my favorite but Caleb won me over with the birthday gift! I am a TVaholic but love Supernatural. …can’t wait for it to be back. Fave food steak. 1) The novella I liked best was Tempted, Terrent Vilks and Maggie’s book. Their relationship had been bubbling and building over series books so the novella felt like a culmination of the seeds dropped in the prior books. 2) The television show that I am addicted is Shannara Chronicles. It has Manu Bennett who played Crixus in Spartacus. So of course I have to watch it. I read them..my favorite would be Tamed…i love Caleb. I remember the first time he was introduced i was like wow! This is one hot vamp! Yes, he was a renegade, but you know the likea of them. I was excited when i found out he will be having his own story. He should be! And Lily! She is one spunky woman! Her duties as a Prophet did not hinder her from being who she is..i really like their story. It show how Caleb dealt withe the unxpected turn of events…but never the less…one if the best novellas ever! 1. My favorite one of the novellas is Tamed. The story between Lily and Caleb is bittersweet; she has always loved him and he her. But Lily’s sense of family obligation got in the way the first time and broke his heart. She is determined to live life her own way this time, and this time is with Caleb, despite forces trying to keep them apart! Lately I have been hooked on Grimm. My favorite if I have to pick one (I loved them all) was MARKED. It finally completed the story of Jane and her back and forth banter with Zane and Kalin. Loved Tempted, liked Max in the story. Read all of them, an awesome series. I haven’t read the novellas – BUT I WANT TO! My favorite TV show right now is Agent Carter, whuich starts up again TONIGHT!!!! My favorite food is lasagna, which I made yesterday. Twisted would be my favorite novella. Maggie has had enough crap happen. I wanted her to have a little happiness. Her happiness doesn’t come easy with the demons wanting her. Luckily, Terrent has her back. I have read all 3 novellas! Loved them all but my fav was tamed. Loved the chemistry between the 2 main characters,there were some funny parts as well lol. Simply love all your books Rebecca. I’ve read them all and it’s too hard to pick a favorite as each holds a special place in my heart for each of the characters. Off season it is Game of Thrones and on season it is The Flash. I love Pizza or My mom’s cooking. Have all of the do books! And Caleb and ily are my favorite of the three in question! No favorite TV show for now! I love junk food of all kinds! Loved Tamed, Caleb & Lily the outcast & the lady. Favourite TV shows at the moment The Chaser (quiz show) also all the NCIS, Criminal Minds. Favourite food anything I haven’t cooked, well almost anything some things I won’t eat. I think Tempted the best, though Tamed was a close second. What am I saying…I loved them all! It was just such fun seeing Max deal with Sarah. As far as tv shows, my favorites right now are the Shonda Rhimes trio of Grey’s Anatomy, Scandal and How to Get Away with Murder, and I love the new show Quantico. I loved Tempted, Max and Sarah’s story because she is so sweet and brave, she keeps trying to prove that she can help Max and hold her own yet she gets herself into more trouble each time. Max’s anxiety in trying to keep her safe must have been on extreme overdrive the whole time but his gentleness and patience with her are so sweet. I am addicted to Lost Girl. Dark fey against light fey. I love the magic and adventures along with some steamy scenes along the way. My favorite character is a Valkyrie because she is so strong yet extremely empathetic to humans. My favorite food is coffee ice cream with dark chocolate chips…YUM! I just LOVED Provoked. I started laughing on the first page and could not stop. Still makes me grin to think about it. Oh Lordie, now I’m going to read it again. I am hooked on the TV show Code Black. I cry and laugh both over the best medical show on tv. Tempted was my favorite, because it was also my introduction to the series. You always remember your first. I have read all your books, who has time to watch TV when your writing such amazing stories with characters that come alive and jump off the page to surround in their world. If I answered FOOD! would you be able to tell which is my favorite? I only wish I was addicted to one television show: Here goes: NCIS, NCIS Los Angeles, Food Channel: Worst Cooks in America, Masterchef (regular and junior); Code Black, Criminal Minds and the list goes on. I’m currently addicted to The Shannara Chronicles and Supernatural! I love Italian food, especially lasagna and stuffed shells. I am addicted to How To Get Away With Murder! I’m a Mexican food lover. I have read every book you had written. My favorite novella was Twisted because I wanted to know more about Maggie, she was such a mystery. I read it the summer of 2013 and I remember reading it on the beach and I loved her story. She and Terrent were hot. exciting and just fun to read. My favorite food is shrimp with linguine topped with a cheesy white sauce. My favorite shows are NCIS: LA, Married at First Sight, Mike and Molly and my #1 show of all time is Doc Who. Yeah, I’m a Whovian. Of the three novellas Twisted is my top favorite, and that’s because I’d been dying to know what happened to Maggie and understand Terrent’s reactions to her. I have and have read all of them and can’t pick a favorite. I love them all. My favorite tv show is The Librarians right now. And my favorite food at the moment is frozen blueberries to munch on in the evening. I’m enjoying the new TV show Shadowhunters and I like The Originals. Tempted. I love Max he is such a contradiction so getting to see more of him was awesome. I love this entire series! Of these, I would probably go with “Tamed”. I loved the chemistry between Caleb and Lily and was so glad they had come up with the “cure” to allow them to be together. It was also funny how reluctant Caleb was to accept his new calling at first. I have read all of them and I have to admit that I can not choose a favorite book, although my favorite couple through them all was Janie and Zane, but their book was not my favorite. I’ve recently discovered Shameless on Showtime and it’s seriously twisted and addictive. Alas, I have not read the books as yet. I do look forward to reading them in the future though. I have been addicted to Supernatural since it first aired, & have added Shadowhunters, which is based on the ‘Immortal Instruments’ series by Cassandra Claire that aired January 12 on Freeform to the top of my addiction. It is standing right next to Supernatural. My favortie food? Well, any kind of mexican food, but the crunchy Cheetos are my favorite munchies food. Mm…mm…mmmmm!!! It’s really hard to pick one because they’re all wonderful ( I reread them all the time) but I’d have to go with “Tamed” as my favorite just because the beginning scenes are hilarious! My favorite shows are Blacklist and Hawaii 5-0 and favorite food is baby back ribs with a side of frys! I haven’t read the novellas yet. I dont like “reality” tv, but am addicted to The Shahs of Sunset. Oh and since I’m not addicted to a TV show (other then Game of Thrones, no new shows for a few more months) my favorite food right now is yams. I’m currently addicted to “The Shannara Chronicles” on MTV. It was made in New Zealand — gorgeous landscape and wonderfully complex characters such as fae, Druid, demons, trolls and humans known as Rovers.